Just add water and see what happens! Compressed Sponges are 1/8" and grow to 1/2" when wet. Make for great give-aways! Long-lasting and dishwasher safe. Use compressed imprinted sponges in your mailers. Made with cellulose fiber drived from wood pulp and plant fiber. 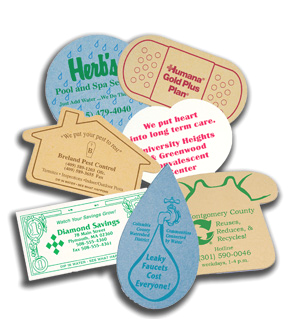 With your imprinted message and long life, compressed sponges are a great advertising value. Personalized sponges have had great success when used in mailers and are very effective when given to families that have children. Be sure to soak up on this great advertising item! An additional $40 non-refundable artwork layout charge (per customized imprint color and side) must be paid before work can begin. Choose from many different shapes in 4" and 5" sizes. 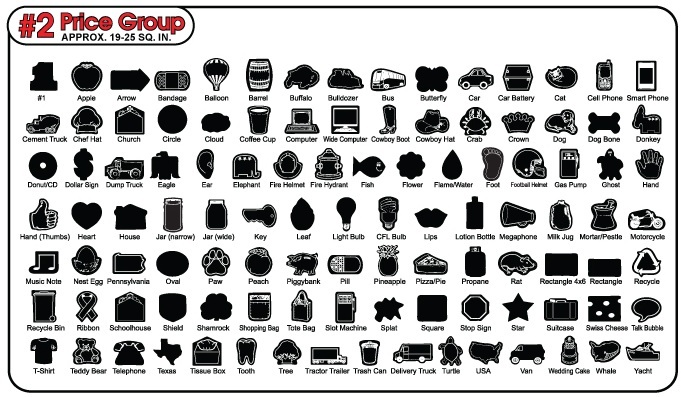 4" Compressed Sponge Shapes Include: Apple, Bandage, Butterfly, Circle, Cloud, Diamond, Ducky, Ear, Fish, Flame/Water, Flower, Foot, Football, Frog, Heart, House, Kidney, Light Bulb, CFL Bulb, Ohio, Oval, Paw, Peach, Piggy Bank, Pop Bottle, Rectangle, Ribbon, Square, Star, Telephone, Triangle, Dollar Bill. 5" Compressed Sponge Shapes Include: #1, Apple, Arrow, Bandage, Balloon, Barrel, Buffalo, Bulldozer, Bus, Butterfly, Car, Car Battery, Cat, Cell Phone, Smart Phone, Cement Truck, Chef Hat, Church, Circle, Cloud, Coffee Cup, Computer, Wide Computer, Cowboy Boot, Cowboy Hat, Crab, Crown, Dog, Dog Bone, Donkey, Donut/CD, Dollar Sign, Dump Truck, Eagle, Ear, Elephant, Fire Helmet, Fire Hydrant, Fish, Flower, Flame/Water, Foot, Gas Pump, Ghost, Hand, Hand (Thumbs), Heart, House, Jar (narrow), Jar (wide), Key, Leaf, Light Bulb, CFL Bulb, Lips, Lotion Bottle, Megaphone, Milk Jug, Mortar/Pestle, Motorcycle, Music Note, Nest Egg, Pennsylvania, Oval, Paw, Peach, Piggybank, Pill, Pineapple, Pizza/Pie, Propane Tank, Rat, Rectangle 4x6, Rectangle, Recycle, Recycle Bin, Ribbon, Schoolhouse, Shield, Shamrock, Shopping Bag, Tote Bag, Slot Machine, Splat, Square, Stop Sign, Star, Suitcase, Swiss Cheese, Talk Bubble, T-Shirt, Teddy Bear, Telephone, Texas, Tissue Box, Tooth, Tree, Tractor Trailer, Trash Can, Delivery Truck, Turtle, USA, Van, Wedding Cake, Whale, Yacht. Select your custom imprint color. Available custom imprint colors are black, white, red, blue, reflex blue, forest green, and burgundy. PMS color match as close as possible is available on our Compressed Sponges at no extra charge. Compressed Sponges are also available in 4-color process (available on white sponge only). Contact us at 706-374-0710 for pricing. Tag line "DIP IN WATER * SEE WHAT HAPPENS" can be added. Be sure to ask for it if you want it printed. Quality Pledge. We promise the best quality and will provide you with a reputable product that will fulfill your advertising needs. Honesty is the best policy and we realize that word of mouth advertising from producing a quality sponge, jar opener, discount bumper sticker or one of our other fine products is best.